There was some great stuff in this book. Huge sections that were awesome. There was also a lot of disgusting stuff, and for me it was way too long. I listened to the audiobook and the narrator Steven Weber couldn't have done a better job. He was phenomenal. But even with amazing narration and some fantastic storytelling, the story at 45 hours was just too long. I picked this novel up because I heard it was kind of like King's novella "The Body." That's the one the movie Stand By Me is based on and it's easily one of my all-time favorite stories. While there is a group of kids who even have a clubhouse like in The Body. The story is much different though and even though there are a lot of things I like about it, overall I wish I would have spent 45 hours listening to a different book. As usual King does a great job building characters you feel like you know. Each character is very different and has their own little traits you come to love. With all the time he took to tell this story he fleshes out a whole gang of kids and their enemies. Not only the characters as kids, but as adults too. The people they became, and then going back and forth between their story as kids unfolding and their story as adults going back to the place they were as kids. It was an epic tale, but it could have been so without being so epically long. I was ready for it to be over long before it was over. Part of that might be because I don't like the darker books where king writes about child abuse and spousal abuse. I can only read so much of that stuff and this book had a bit too much of it for my liking. I was really cheering for the characters until near the end. When the gross scene describing what they did as kids happens. That's when I almost put the book down. Instead I skipped through it and finished the rest of the story. The end after that wasn't terrible. I liked the way the story closed out. You get to relive some of the fun things you remember from earlier in the book. "High Ho Silver! Away!" is what I'll say to hint at that. So in closing, were their great moments? Yes. Did King knock it out of the park building believable breathing characters? Yes that's what he's best at. But in the end the story was just too long and too dark for my liking. I know many other readers feel differently about this one, even claiming it as their favorite King book. The other book people claim to be King's best book is The Stand. I will have to read that one soon. For now I'm on to reading one of his newer novel's called Mr. Mercedes. I've really liked all of Kings recent books and so far I'm liking this one. IT is not one I'd recommend, but you don't have to take my word for it. Have you read IT? Did you love it? Hate it? 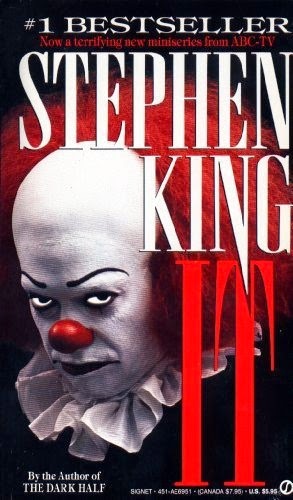 How about any other Stephen King books? Sound off in the comments section and thanks for stopping by.